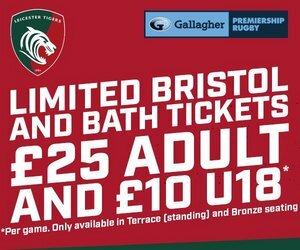 Gareth Owen talks Tigers youngsters, competition for spots in the side, this Saturday's Cup clash with Worcester at Welford Road and much more with LTTV at Oval Park. Scroll down to watch the interview with the Welshman below on LTTV. Gareth Owen has joined the chorus of Tigers senior players and coaches in praising the contribution of the Leicester squad's younger members after another impressive showing in last weekend's Premiership Cup opener against Saracens. "Their intent, work rate and work ethic has been outstanding and they've really given Geordie something to think about." Owen, who featured from the bench in the 29-21 loss, says the resilience shown in fighting their way back in to the match was one positive to take away from Allianz Park. "We were disappointed with the loss, but the saddest part was that we had done enough to come away with something better," said Owen. "We showed a lot of resilience in not letting them run away with the game." When asked about the input of the younger members of the group in Saturday's fixture, Owen says their performances have presented head coach Geordan Murphy with selection options after impressive showings on the pitch and training paddock. "Their intent, work rate and work ethic has been outstanding and they've really given Geordie something to think about," he said. "I want to stay injury free and do what I do." Owen himself, who has had an injury interrupted stint in Leicester since joining at the beginning of the 2017/18 season, says he's no fully fit and focused on giving Murphy his own selection headache in a midfield that includes internationals Matt Toomua, Kyle Eastmond and Manu Tuilagi, as well as experienced Tiger Matt Smith and England U20s centre Tom Hardwick. "I just want to get some game time under my belt and get a good run under my belt ... I want to stay on the pitch, stay injury free and do what I do," said the Welshman. Worcester, who the Tigers host on Saturday afternoon, have recorded two wins in their two most recent visits to Welford Road and Owen admits those results have embarrassed the squad given their pride in restoring the historic Leicester venue to its fortress status. "I think it's always in the back of your mind ... it's embarrassing as we think of it as our fortress," Owen said. Watch the full interview with Owen below on LTTV, including an insight in to Brett Deacon's role as head coach during the Cup competition and much more.